For most of us buying gifts this Christmas will undoubtedly have a request for a tablet. If the request is not brand specific then the Sony Xperia Tablet S is worth considering. The price is reasonable (just about) for what you are getting and the features are comparable to other tablets on the market. If your TV, Blu-ray player, set-top box or sound system has a built in Universal Remote, then Let the Xperia Tablet S be your main or backup remote control. The Xperia Tablet S allows you to create personalized shortcuts for these devices. Available as a free download is the Sony “Watch Now” app, a visual recommendation program guide that let you see thumbnail of titles. With “Watch Now” you can tweet and share your thoughts on facebook. The Xperia Tablet comes preloaded with Sony Entertainment Network Services, giving access to a library of songs, movies and TV shows with a single sign on. You can purchase or rent movies and TV shows and subscribe to Music Unlimited. The Xperia comes with Sony’s Album, Walkman and Video apps for you to manage all your content. 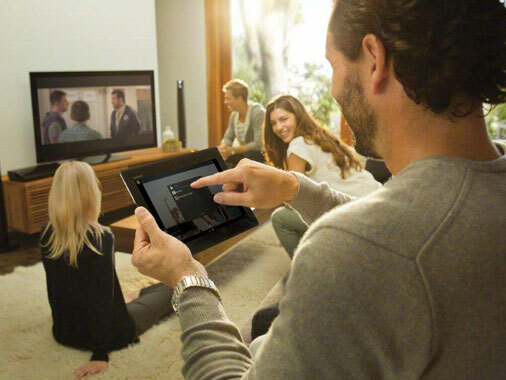 I live in a Sony home then the Xperia Tablet S will be right at home connecting to your other Sony appliances such as the VAIO PC or Bravia TV. It can also compile a list of song and images that your friends liked via Facebook. With its “throw” function, you can stream music, movies and photos to other DLNA compatible devices in your home. You can purchase and read your favourite eBooks with the pre-loaded Reader app and manage your bookshelf across multiple devices, including Sony Reader and Xperia Smartphones. Enjoy PlayStation-style gaming on the Xperia Tablet S using the on-screen virtual DUALSHOCK controller. You will buy a game once and be able to play it on Xperia Tablet S as well as any other PlayStation Certified device. Small Apps allow tablet owners to truly multi-task by using a minimized version of the browser, calculator, remote control, recorder, timer, memo or scrapbook simultaneously while using another application. Any widgets downloaded to the device can also be added to the Small Apps. You can create user profiles for different family members, you control which apps and widgets they have access to. The Xperia Tablet S comes in a thin light thin and light aluminium body with it distinct fold top comfortable grip and feel. It is powered by a NVIDIA Tegra 3 quad-core processor and Google Android 4.0.3 operating system. It includes a full-sized SD card slot for expanded storage and HDMI connectivity, built-in Wi-Fi compatibility, users can browse the internet, check e-mail and access digital content anywhere there is a Wi-Fi connection. Sony's own signal processing technology ClearAudio+ mode for enhanced Sound quality. The Xperia Tablet S is available at amazon.com for $399.99.